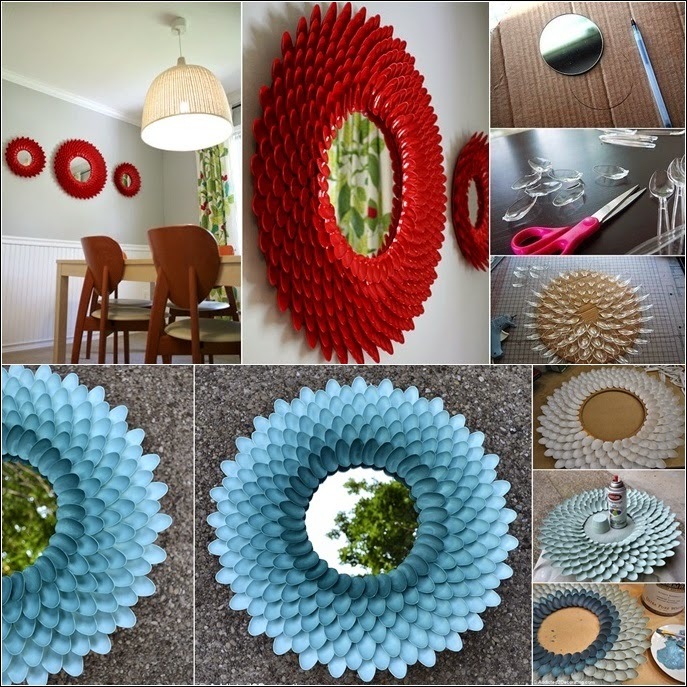 Decorate your simple plain mirror with these amazing spoons to make your mirror look like a blossoming flower. You can create this plastic spoon mirror with white spoons, different colour ones or create an ombre (fading colour) effect such as the blue one above. With a colour spry you can paint the plastic spoons any colour you like. Simply follow this easy picture tutorial above and your result will be outstanding! Glue the plastic spoons on a cartoon such as shown above and then glue the mirror on the cartoon carefully right in the centre. 4 Cans Spray Paint, Mirrors. So we have finished writing the post DIY Plastic Spoon Mirror and wish to offer you the interior designs so that you can share with friends and relatives on Facebook Twitter and Google Plus and other social networks and digital networks, also you can send comments through the box below to express your opinion on the article, so you could send suggestions and preferences to take into consideration for editing and adding, a bouquet of love appreciation and respect sent to you through Interior4Design platform.